Two Chinese sisters have landed a dream trip to Buckingham Palace and the Peppa Pig World theme park in the United Kingdom, after their online appeal to meet the Queen enchanted the British ambassador to China as well as millions of social media users. 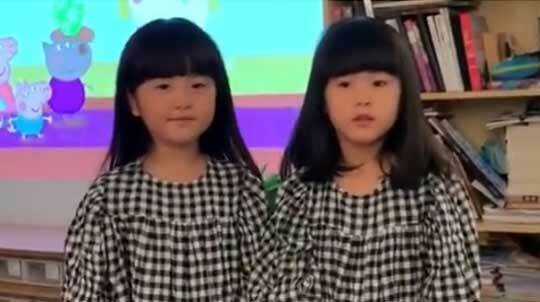 Five-year-old twins Mi Ai and Mi Ni, who live in Beijing, appeared in a video on Chinese social media platform Weibo last week, where they spoke of their love of British animation Peppa Pig and their desire to visit the royal residence. "Hello grandmother Queen," Mi Ai said in the video, which has been viewed more than 19 million times. "I'm five-and-a-half years old. I can play the piano, I am learning to dance and I'm learning English from my mom." Mi Ni said she and her sister want to visit the gardens at Buckingham Palace, just like Peppa Pig and her friends did in a special episode that aired last May around the time of the royal wedding between Prince Harry and Meghan Markle. In exchange for an audience with the monarch, the girls promised to help around the home, give their mother massages, and take their grandmother's slippers at the door whenever she visits. British Ambassador to China Dame Barbara Woodward answered their call with her own video, inviting the twins to her residence in Beijing. "Hello Mi Ni and Mi Ai," she said in a post that has been viewed over 9 million times. "I'm the British ambassador, so I'm the Queen's representative in China. I'd like you to come and visit me in my house in Beijing and we can perhaps have tea and scones in a British style." The twins accepted the ambassador's invitation and joined her for a traditional afternoon tea on Monday, when they ate cake and drew pictures of their favorite characters from Peppa Pig. The ambassador, along with the UK tourism authority VisitBritain and Chinese streaming service Youku, has organized for the girls and their parents to tour the UK. "I was really touched by Mi Ai and Mi Ni's video," Woodward said. "Children's dreams are precious and I'm delighted to work with Youku and Peppa Pig to make theirs come true." The girls are scheduled to tour the studios where Peppa Pig is made, take a trip to family theme park Peppa Pig World in Hampshire, and visit Buckingham Palace. The Queen has not yet confirmed if she will be there to welcome the girls. Youku general manager Liao Huainan said that the company will hold a competition called "Special Invitation from the UK" in which Chinese children and their parents stand the chance to accompany the twins on their trip to Britain. Peppa Pig has a legion of loyal fans in China. The program first debuted on Youku in 2011, and was later re-released via CCTV in 2015. It is now available on several streaming platforms and has amassed more than 30 billion episode views. Toronto-based Entertainment One, which owns the rights to Peppa Pig, has organized a series of releases and events to mark the Year of the Pig in China. The company has partnered with Alibaba Pictures on a feature film. Peppa Celebrates Chinese New Year will come out in cinemas on Feb 5. "There is a huge fan base for Peppa Pig in China," said Olivier Dumont, president of family and brands at Entertainment One. "We've worked closely with Alibaba Pictures to create content and cinema-themed merchandise with special cultural significance that will resonate with Chinese audiences. We look forward to delighting Chinese families with an unforgettable cinema experience when the film opens." A teaser for the film released this month struck a chord with the Chinese public, gaining more than 1.5 billion views online. The promo focuses on an elderly man in rural China who assembles a Peppa Pig toy out of scrap metal as a Spring Festival gift for his grandson. Wei Zhang, president of Alibaba Pictures, said that the Peppa Pig series emphasizes the importance of family values. "That is something that deeply resonates with Chinese audiences," said Zhang. Entertainment One is also partnering with Happy Kids Cultural Development to take a Peppa Pig stage show on a three-year tour of China. Merlin Entertainment, the British operator of visitor attractions, has confirmed plans to open a Peppa Pig World of Play in Beijing this year, having opened one in Shanghai in 2018.